If you’re tired of eating the same foods whenever you fire up the grill, shake things up with Premio Sweet Italian Patties. Enjoy them individually on a bun or stack them on top of each other to make a double-decker that’ll satisfy your taste buds and your tummy. Not grilling tonight? Add some cooked crumbles to the top of your salad or baked potato for extra flavor and texture. Pre-heat grill. Place patties on grill over medium flame for 15-20 minutes. Use spatula to turn patties often until golden brown. Serve and enjoy! Heat a pan to medium temperature. Add 3 tablespoons water and place patties in pan. Cover the pan, continue heating for 10-12 minutes, turning the patties often. Remove cover and continue cooking for 5-10 minutes or until golden brown. Serve and enjoy! Heat the patties approximately 1 minute on high or until warmed to your satisfaction (adjust time according to your microwave). Always cook sausage patties to a Minimum of 160° F.
Premio Fresh Sweet Italian Sausage Patties contain flavors and spices, like paprika, that complement any recipe perfectly. Try the Sweet Italian Sausage Patties in Sweet Stuffed Peppers, Rigatoni Alla Premio or a delicious, yet quick-to-make, Sweet Sausage and Pepper Parmesan. The Sweet Italian Sausage Patties make the Sausage Patty Panini and Sicilian Sausage Patty Surprise equally mouthwatering good. So go ahead and indulge your taste buds with Italian sausage patties, perfect for the burger lovers looking for that wonderful, true Premio Italian taste. Molto Delizioso! Patties vs. Links? The Choice Is Yours! Traditionally, when people think of sausage, they think of the well-known tubular casing sausage known as sausage links. 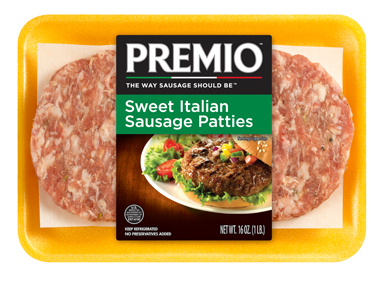 But sausage patties are a perfectly valid way to enjoy Italian sausage — especially Premio Sweet Italian Sausage Patties. So why do people prefer sweet Italian flavored sausage patties to classic links or vice-versa? What are the pros and cons of each? In some cases, it’s just a matter of personal preference, and some people may even enjoy sausage patties at certain times and sausage links at others. However, the place where sausage patties enjoy a clear advantage is in the case of breakfast sandwiches. Sausage patties are just perfectly shaped to go inside a breakfast sandwich. Sweet Italian sausage patties can fit right in with eggs and cheese on a biscuit or an English muffin to make a delicious and easy-to-eat breakfast treat. Sweet Italian sausage patties are also great choices for breakfast sandwiches. Since they’re a little less spicy, they work well as part of the first thing that hits your stomach in the day, filling you up without overpowering you. Of course, you don’t only need to enjoy your sausage patties in breakfast sandwiches. You can enjoy them as a side dish with eggs just as you would sausage links, or have them by themselves or with side dishes of their own for lunch or dinner. Some people prefer our sweet Italian flavored sausage patties because of the way they cook. Sausage patties tend to brown more all around the surface of the patty when frying because of the way they make contact with the pan. With links, it’s the sausage casing that browns. Neither is necessarily better — there’s just a slightly different flavor that fans of sausage patties may prefer. On the other hand, sausage links tend to be a little moister than sausage patties. For this reason, when frying your sausage patties, you want to be sure to add water. Some may find they prefer the texture of sausage patties to sausage links. They don’t like the idea of biting into a casing, or they don’t like to eat tubular food unless it’s on a hot dog bun. For these people, a sausage patty is an ideal way to enjoy the delicious taste of sausage with the bite and mouth feel they prefer. Fortunately, Premio makes delicious mild and sweet sausages in both patty and link form, so whether you have a favorite or you go back and forth, you’ll always have a place to get delicious sausage for you and your family to enjoy! Use our store locator to find where our Italian sausage is sold near you!